loving little boy and very sweet. This is John's brother Kaden my second grandson!! 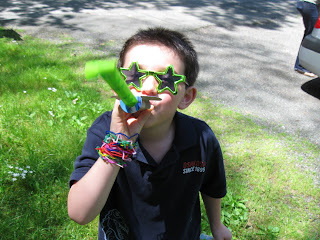 Kaden will be 5 in July. He is so beautiful and sweet. I wanted to just scoop him up and hug him all the time!! Here we are playing in the playground next to their house. Resting in the shade together!! Whoo Hoo I hit a ball that Kaden had thrown to me!! Here I am with Andy and Dana and Me with my other son Ed on the left. 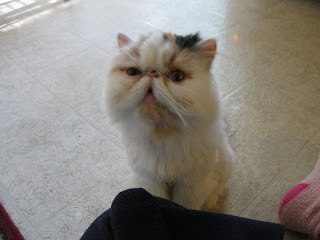 We had breakfast together one morning! John and Kaden teaching Grandma some very important moves with their Wii game!! Dinner I made last night I was there. Ed and his fiance' Kristin and her little girl Piper on the left. I'm Flying Away to See My Family.....and other Tid Bits!! What a living doll she is. She is quite the little diva! This AM she got up on my vanity stool to have a look in my Lighted magnified makeup mirror, and she rubbed the edge of it with her chin upon inspection of her beautiful self!! Too funny!!! Please Welcome Little Miss "Daisy" ......A New Member of the Family!!!! I have a brand new kitty!!!!! was Amber and one was Daisy! little ball of fur real hard! you this little cutie pie. he will always live in my heart. I think Sam would have approved of little Miss Daisy...don't you think so too?? This little fellow found a way to get all goodies!! 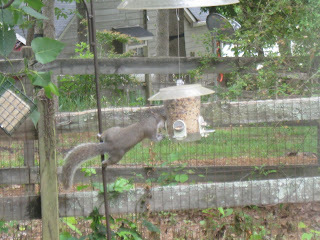 He was so determined to get the bird seed and succeeded!! This is the first year we had a very determined squirrel to accomplish this feat!! It is a chilly cloudy day oh yes and a bit windy as well. I really do not have much to write about today....I am actually getting ready for my visit to New Jersey to my family. Not sure what the weather will have in store I only know I don't have to worry about snow storms this time!! I made a few more things for the shop and brought them over this past Saturday. 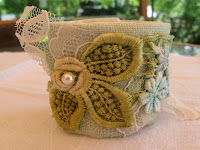 My friend Terry who owns the shop said that everyone loves the items and some ladies were very interested in the cuff's as well...so we shall see!! I will probably not write to you all till I return towards the end of next week. So I wish you all Love, and God's Blessings in All that you do!! Beautiful Roses...they smell so lovely too!!! 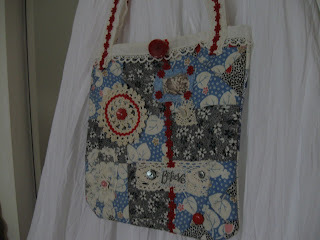 A new "Victorian Day Bag" for the Shop.....and other Tid Bits! I feel like this is Deja vu. show up in my completed Blog list so I am doing this again today. 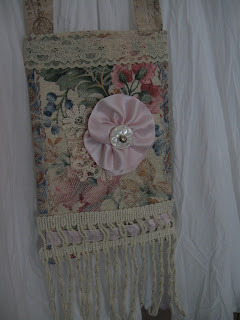 some vintage buttons along the top of the fringe embellishment. What do you think?? children. YAY!! It's about time right? feeling too well at the moment. Wishing you All Love and a wonderful weekend too!! This Peony is just Gorgeous!!! in the lovely Garden area. Day and post a picture of it. I am Soooo Excited......Two Shops Want To Sell My Items!!!! I have been making things for a shop here in Georgia and one in Arizona!! WHOOO HOOO!! Who would have thought...??? ?